Brazo de Mercedes is one of my favorite desserts. That soft, marshmallowy texture of the egg white layer and then that sweet, custard-like egg yolk mixture in the center is just heavenly. So when a friend gave me the idea of turning it into a cupcake, I quickly put my thinking cap on and thought of how I could interpret these flavors into a cupcake. I've posted this photo before but only as a feature in the menu from the now defunct Sinfully Sabrina Cupcakery. I used to take cupcakes orders (mainly from friends and family, I'm lucky that way!) so I never gave away the recipe (Sneaky me!). But due to popular demand, and just my plain love for you guys, I am finally sharing this recipe. Use it well and use it good, my dear friends. 1 cup buttermilk or 1 Tbsp. white distilled vinegar+1 cup whole fresh milk, room temp. Mix all the dry ingredients (flour, sugar, salt and baking soda) together. In a mixer, combine wet ingredients (eggs, buttermilk, oil, white distilled vinegar, vanilla extract) at low speed and gradually add the dry ingredients until lumps are gone. Pour vanilla cupcake batter, about 1/3 cup at a time. I use an ice cream scooper. 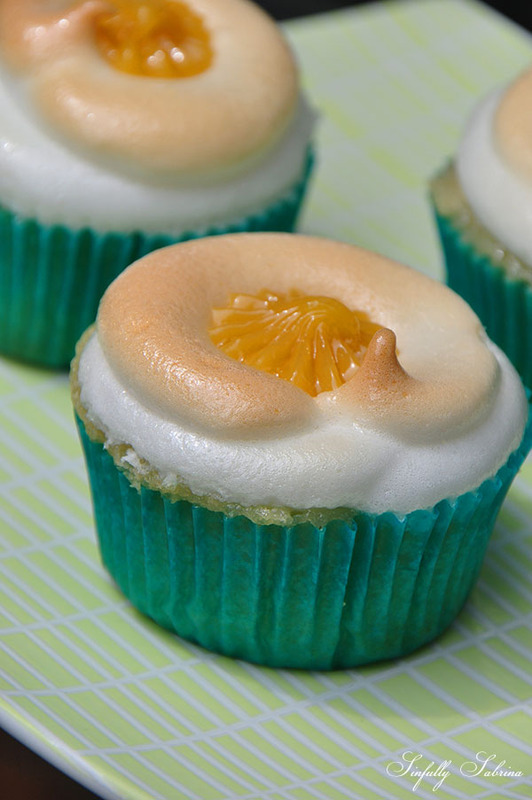 Place meringue frosting in piping bag and make a crown around each cupcake, leave center unfilled. Bake using the broiler for about 2-4 minutes until the meringue has turned a light golden brown. Watch carefully as it can get charred quickly. Add egg yolks and whisk until mixture thickens, add vanilla extract. Once cooled, spoon/pipe mixture in the center of the meringue crown.